It is the season of game day parties, and that means that we should be arming ourselves with a solid arsenal of very addictive snack recipes. I love snacks. Cheese platters, crostini, and don't even get me started with that buffalo chicken dip. Mr. Pedantic and I are big proponents of snack dinners. I mentioned a couple months ago that I had gotten into the habit of making at least one batch of homemade chex mix a week. We got hooked on it out of the blue and the infatuation is far from over. However, I wanted to change things up a bit. I wanted to bring the essence of my favorite combination ever - sweet and salty - to my bowl of chex mix. This chex mix requires a few extra steps, but the results are so worth the effort. We are essentially making two different snack mixes here. The first combines almonds and rice chex cereal which are coated in a sticky, sugary mixture of orange zest, brown sugar, and warm spices. The second mixture is a combination of corn chex and pretzel twists that have been drenched in a more traditional mixture of soy sauce, worcestershire, onion powder, and garlic powder. Combined, they form the most perfect salty-sweet mix that will have your taste buds aflutter with surprise. I took this mix to a party and giggled to myself as snackers reached in for handful after handful trying to figure out exactly what was up. There's nothing wrong with the classics, but I do relish a good dose of the unexpected. Preheat oven to 250 degrees F and line two baking sheets with parchment paper. 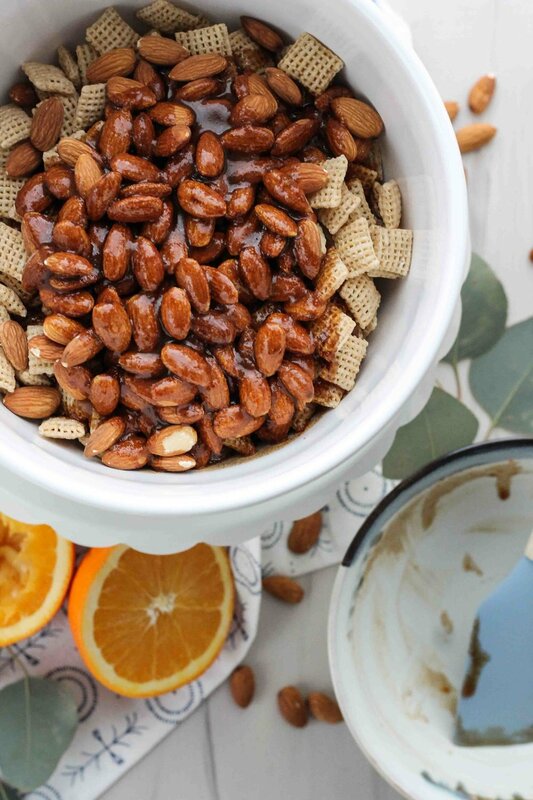 In a large mixing bowl, combine chex and almonds. In a small dish, whisk together melted butter, brown sugar, orange zest and juice, spices, and vanilla extract. Pour the butter mixture over the chex and almonds and toss with a spatula until everything is evenly coated. Spread the mixture out onto one of the prepared baking sheets. In a large bowl, combine chex and pretzels. Combine butter, worcestershire sauce, soy sauce, spices, and salt in a small bowl and pour the mixture over the cereal and pretzels. Toss until evenly coated. Spread the mixture evenly out onto one of the prepared baking sheets. Bake both mixtures for 1 hour, stirring each every 15 minutes. Allow to cool completely, then transfer the mixtures to a large bowl and toss to combine. Happy snacking! It all started with a bag of popcorn.